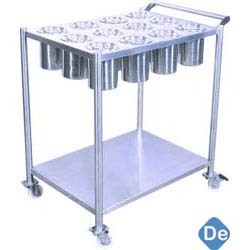 Masala Trolley Manufacturer/Supplier/Exporter in Delhi, Masala Trolley in Delhi. We have successfully positioned ourselves as a reputed organization, engaged in manufacturing and supplying a wide range of Masala Trolley. These are manufactured by a team of dexterous and diligent professionals in strict compliance with industry defined standards. The masala trolleys offered by us with key feature superior stainless steel finish to provide in them better durability standards. These are designed with multiple compartments placed one above the other to provide segregated & more storage space of a wide variety of masala containers.